Need more than one Red Plate? This might be just the thing. 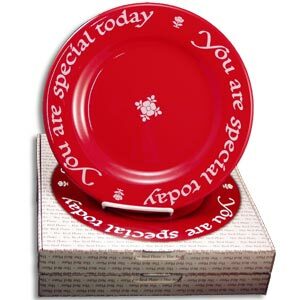 Two original Waechtersbach, “You Are Special Today” red plates. Each plate is individually boxed and comes with a pen to record special guests. A favorite of people who use the red plate as their go-to wedding gift. Makes it easy to always have an extra ready at hand. Everyone has liked the idea and they use them frequently. I use mine often.